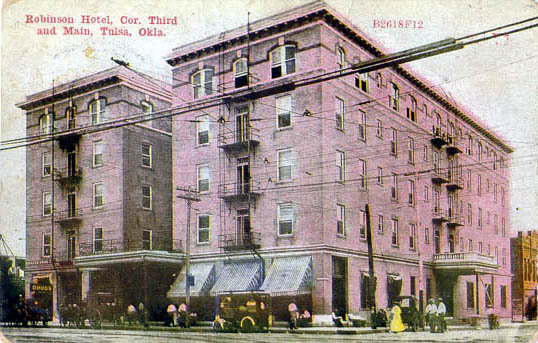 The Robinson Hotel was completed in October 1905 and boasted of eighty-four rooms "with" sanitary facilities. 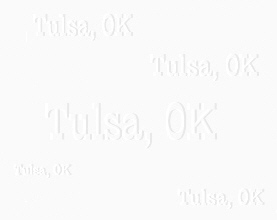 Tulsa's first sewage system was quite incomplete, however, with the sewage being piped from the hotel to a deep ravine on North Main Street near the railroad tracks, where it could find its way to the Arkansas River only if there was a strong enough flow of natural water to the river. The ravine had been a headache to the pioneers from the very beginning when the saw horses sink from sight into the snow-filled gap. ... Residents living in the section near the gorge did not take kindly to Robinson's open sewage system and complained bitterly and finally secured an injunction against the hotel. Stimulated by this action, Robinson put forces into action and finally constructed an outlet sewer to the river. Before this had been completed, the leader of the opposition met Robinson and asked if he took the injunction as a personal affront. "Not at all, not at all!" answered the jovial hotel man. "You did just what I would have done had I been in your place." And to show that he was a good sport, Robinson gave what he advertised as a "sewer banquet" in his hotel penthouse for thirty-two of the protesting citizens and others in January 1906 at the time the sewer was complete.